Somehow a great Man has left us. Even now the story's regarding cause are been aired. It is enough that he passed full in years. The rest is for others and it does not matter. This story matters. We see a man of sound conviction who amazingly lived those convictions. That is something that i have always found far harder to do. We can all grow from this because he ignored all acclaim and reached out to help a fellow human being, and surely over and over again. 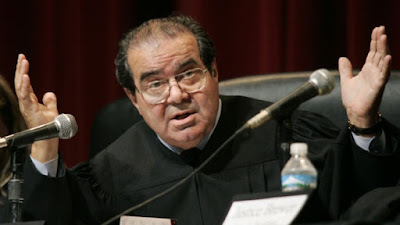 Some of Justice Antonin Scalia’s decisions I agreed with and some I disagreed with. But I’ve never once doubted the sincerity of his beliefs. Now that he is gone from this earth, I can tell a story I’ve held inside for many years, a scene that touched me deeply and profoundly. I cannot think of him without remembering this moment. He held her face next to his, and she talked beneath her tears that were now streaming down his suit. He didn’t flinch. He didn’t try to get away. He just held her while she spoke. This lasted for perhaps more than 5 minutes. He closed his eyes while she she spoke, gripping her back with his hand. I stood there in awe. Here we have one of Washington’s most powerful men, a star by any standard. Cameras followed him all over. That kind of attention can get to you — in time, you might begin to believe that your life is a performance. Not in Justice Scalia’s case. What I saw that day was a humble man, a compassionate man, a man who believed in the power of personal contact. This was the action of a man of true principle and character. In that action, he sought no credit and sought no attention. He was merely doing a humane and beautiful thing. A theme in his career was human freedom. Scalia believed in it. And why? Because he thought humanity could generate better outcomes than all the planning and all the power ever mustered by the central state. This was a principle he lived. I’ve not told this story until now, simply because I’ve long known that he never sought public recognition for his charity. Charity is simply a form of love, and genuine love does not seek out public recognition. With this one action, he touched not only her life but mine too. I can only imagine how many other examples his friends could name. This was a good man. It is so rare for a man of this quality to gain the high level of influence and power that he did in his lifetime. Lord Acton had a dictum that power tends to corrupt. What I saw that day was the rare exception. Power did not corrupt this man. He remained true to himself and true to his principles. How unusual: a public figure in his position he never stopped being a good, even great, person. May his beautiful soul now rest in God’s loving care.